Organizational Behavior 10 Edition In its tradition of being an up-to-date, relevant and user-driven textbook, Kreitner and Kinicki's approach to organizational behavior is based on the authors' belief that reading a comprehensive textbook is hard work; however, the process should be interesting and sometimes even fun. The authors' commitment to continuous improvement makes complex ideas understandable through clear and concise explanations, contemporary examples, a visually appealing photo/art program, and/or learning exercises. 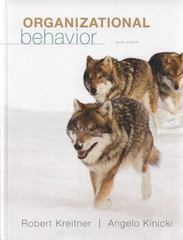 The authors respond to user feedback by ensuring the text covers the very latest OB research and practices.Key topics, such as diversity in organisations, ethics, and globalisation, are recommended by the Association to Advance Collegiate Schools of Business (AACSB) and the Association of Collegiate Business Schools and Programs (ACBSP).Wolf branding book cover: Wolves remain a central theme for Kreitner and Kinicki because they view wolves as an instructive and inspiring metaphor for modern Organizational Behavior. Wolves are dedicated team players, great communicators, and adaptable. These are quintessential attributes for success in today's workplace.